I'd sworn off the soda/coffee combo after an unfortunate sip of Coke Black. (Really, all sips of Coca-Cola's noxious attempt to merge coffee and Coke were unfortunate.) 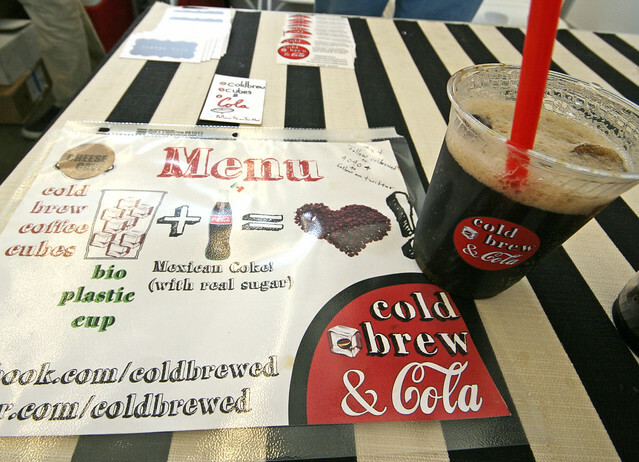 The Cold Brewed Cola at the Cheese Cave booth, however, convinced me to try again. I was skeptical. Would this mix of Mexican Coke and ice cubes made from cold-brewed coffee be a Frankensteinian hybrid or a credible caffeinated pick-me-up? The latter, fortunately. An ideal balance of sweet cola (the cane sugar in Mexicoke is key), and strong coffee, the Santa Cruz Organic Full City Roast has little of the acidity or bitterness of most coffee -- but plenty of kick. It's positively addictive. Look for a Cold Brewed Cola cart to hit the streets of Los Angeles, possibly as soon as next month.